This place got the award for the Best Independent Fish and Chips Restaurant in the U..K. The CEO of London’s popular Timeout magazine, which publishes reviews of all old and new things on offer in London, also declared it to be his favourite fish and chip joint. Surely you must be curious to check out if it is worth all this hype after all. 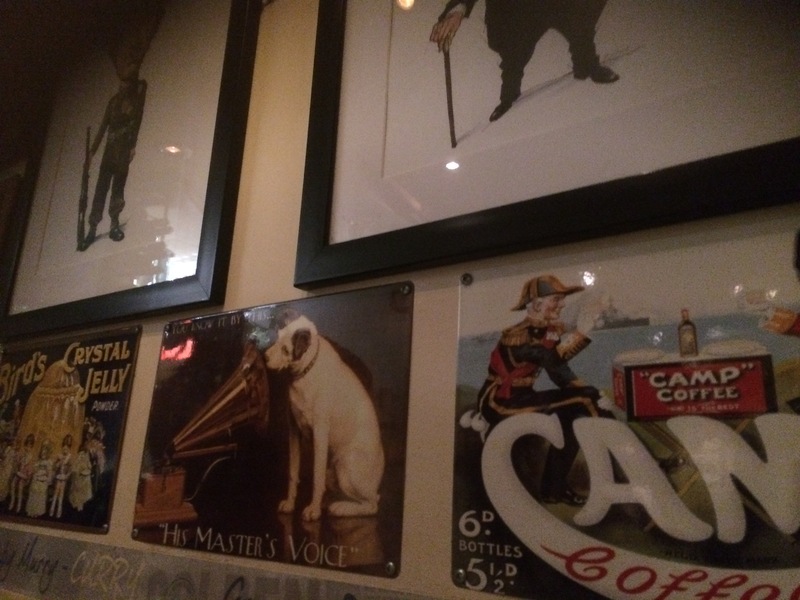 Full of British knick-knack – vintage posters, a mini telephone booth and a jukebox help recreate the 1940s look when Poppies was first established. The waitresses were in red, Polka-dotted diner style outfits and headscarves. And if you choose to takeaway, you get served in faux newspaper cones! The fish is sourced daily from the Billingsgate market and you can taste the freshness. The batter was light and crisp and therefore didn’t overpower the taste of the fresh, flaky fish. 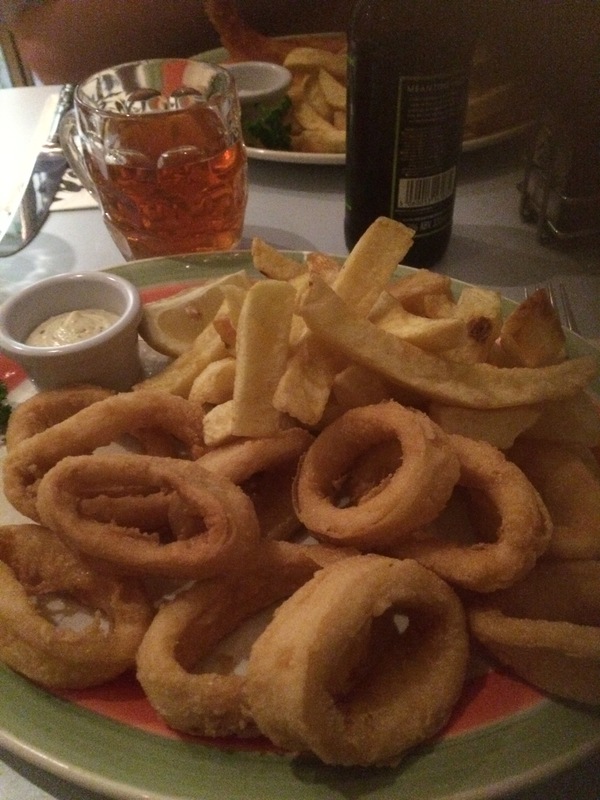 The fries were chunky and the calamari had a good bite without being tough and chewy. While they do also serve some chicken dishes, their expertise lies in the fish. My Victorian lemonade was sweet and refreshing and was a great accompaniment to the fried fish – more places should offer the combo of lemonade with fish and chips. This place transports you back in time to a fish and chippy from the 1940s and offers some of the best quality fish and chips you can get in London without compromising on the prices. 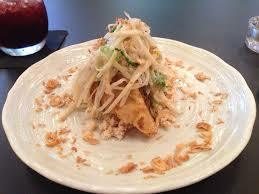 If you want to try eclectic food which combines Asian, European and Middle Eastern cuisines. 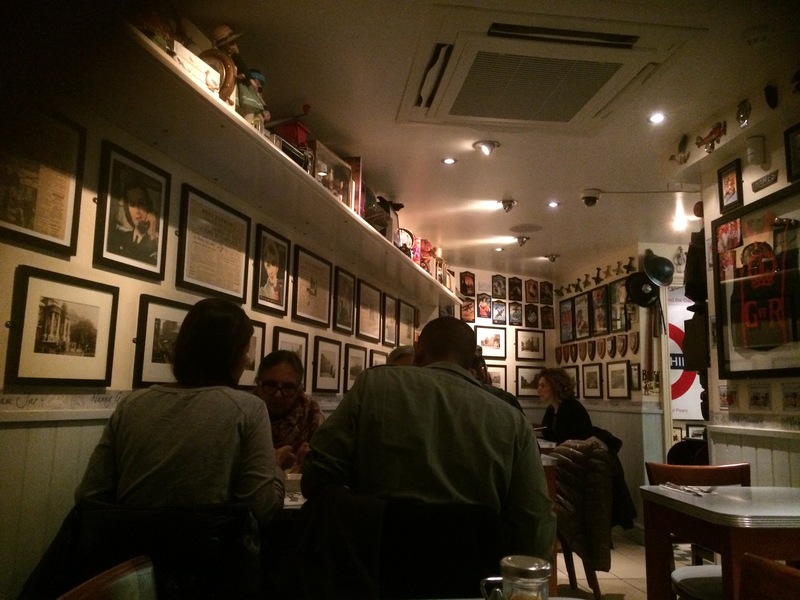 Situated in the heart of Covent Garden, the place has a modern feel to it. A square room with parallel lined tables and minimalist decor. But it is quite small which is why if you come for brunch, you’ll most likely be seated outside since the place is pretty popular among brunch lovers for its Turkish eggs. While there is a good value pre-theatre menu available, you’re best placed in ordering multiple small plates and sharing them because there is much more choice available with these. Of course this also means you can maximise the number of new things you’ll get to try (I can guarantee that you’d not have had the majority of the dishes on the menu before). The dishes we ordered were the Tempura-spiced Dhal Pocket; the Sesame Chilli Salted Squid; the Prawn and Chorizo Scotch Egg and the Caramelised Onion, Feta and Pesto Tortilla. Our favourite was the dhal pocket, a mildly spiced lentil cake stuffed with a mix of caramelised coconut and pickled papaya. The dish had a subtle blend of Indian and Thai flavours. The pesto tortilla reflected a confluence of Greek and Spanish with the caramelised onions adding a French touch. 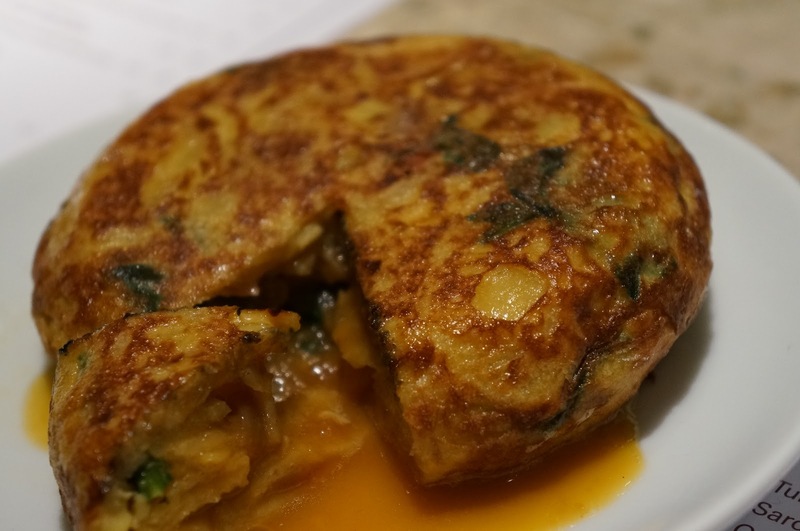 But what wins one over is the super gooey and runny inside – it has for forever changed my expectations for what a tortilla should look and taste like. Every dish was an explosion of flavours and the brains behind the menu definitely have a very good idea of what combinations work, no matter how unusual they are. Portions are pretty small, so you’re recommended ordering five or more plates for sharing between two people. Service was quite attentive even though the restaurant was crowded, with the waiter taking the time to walk us through what the different dishes entailed. Great location, unique and very delicious food merging cuisines from different parts of the world. Ideal for brunch or for an evening tapas style meal.